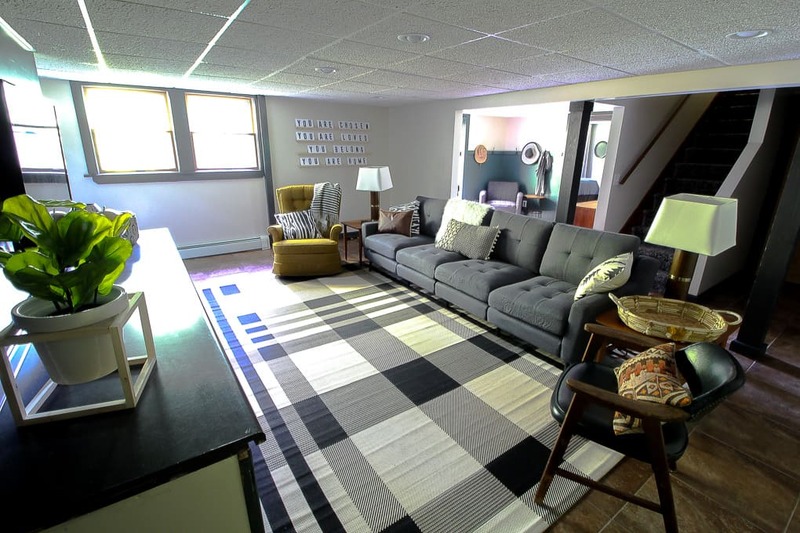 You’ll be shocked that this modern basement makeover was done so affordably! 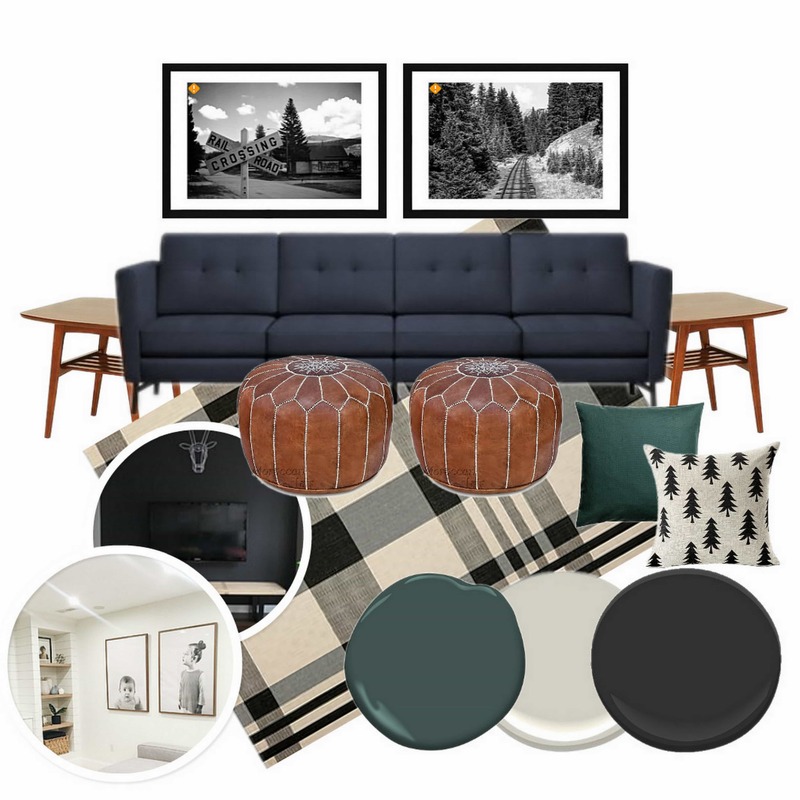 Just recently I shared our plans and mood board for our basement. 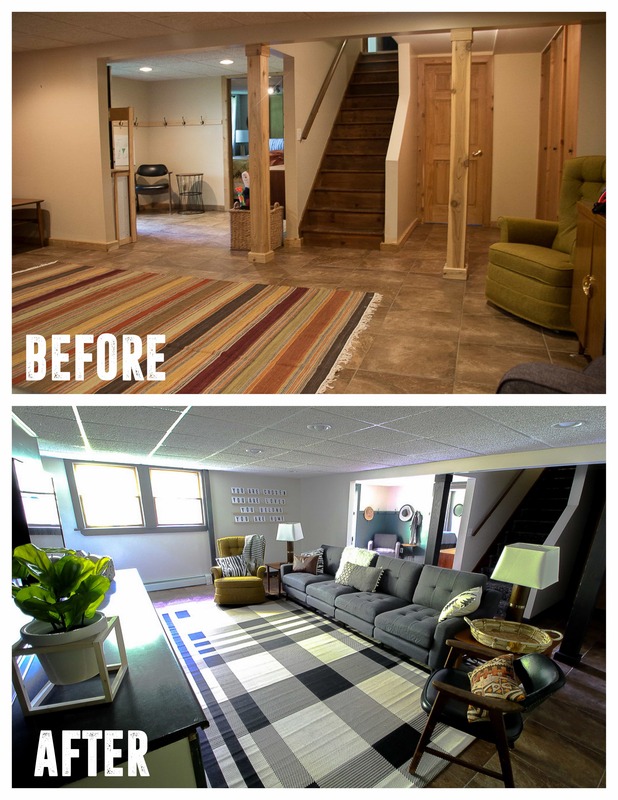 Well just a short two weeks later I’m so happy to be able to share our finished modern basement makeover! I ordered the leather poufs the day I made the mood board, and didn’t realize they were shipping internationally and still will take weeks. So eventually we’ll have the poufs down here too. Otherwise I stuck fairly close to the mood board. Just for reference, here are a few side by sides of the very orange before shots, paired with the modern after shots. 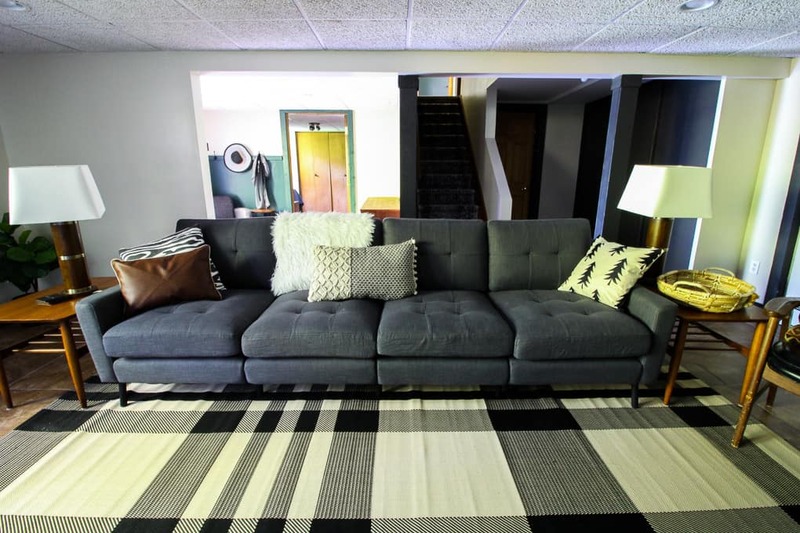 As much as I wanted the vintage sofa to work, it always had a faint smell to it, and I could never get the modern look I love with it. Thankfully our new neighbors had a big empty house to fill and happily took it off our hands. They literally walked it out the back door and through the yards! 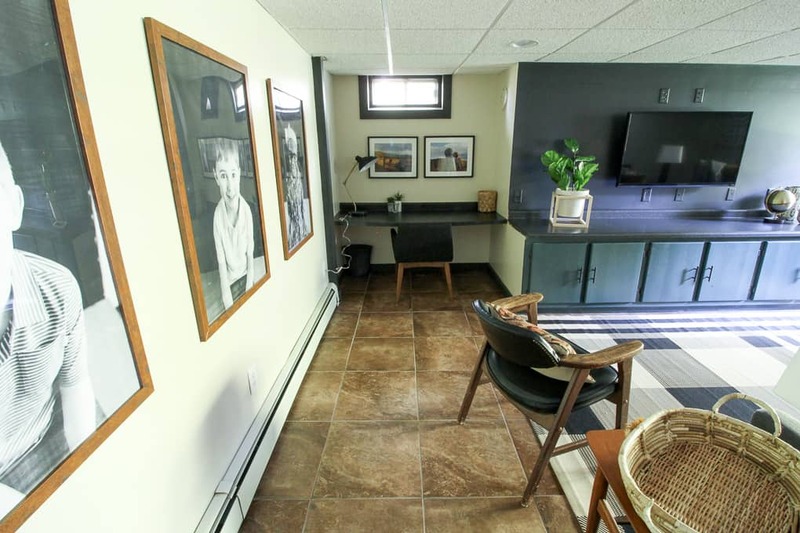 I wanted large art that suited a room mainly for the kids, so these large portraits were perfect. I followed Chris Loves Julia’s tutorial for creating oversized engineer prints. Then I framed them in $15 frames from Michael’s. In total the oversized engineer prints came in for $55. Here is my tutorial for how I created the engineer prints. Above each of the boys’ desks I framed pictures from some of our travels in cheap Ikea frames. It’s a fun reminder of places that we’ve been! The desks were just laminate countertop that was on sale for $32 each at our local hardware store, Menards. The office chairs used to be at our dining table until I moved them down here. 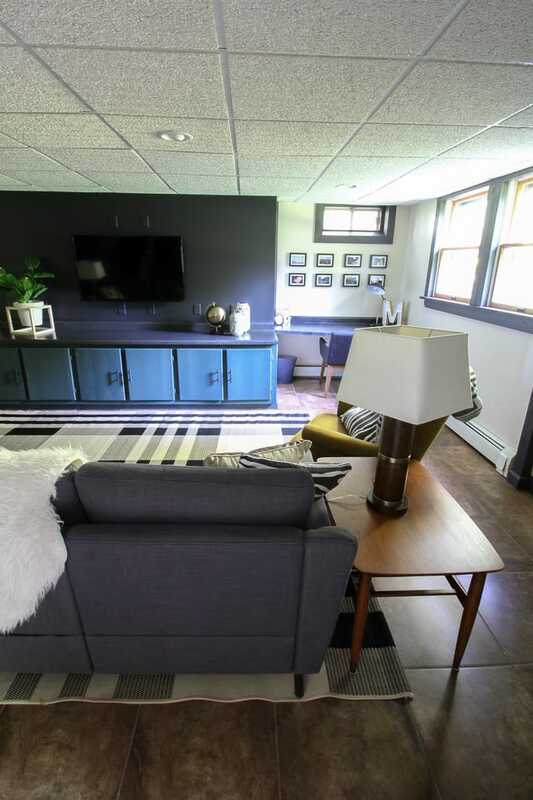 I’ve always wanted to paint a tv wall black and I LOVE the way it looks down here. It really helps disguise the tv! I also painted the built ins with my favorite color, Benjamin Moore “Hidden Falls”. Along with painting them I also replaced the handles with these pulls. **post contains affiliate links** These cabinets are FILLED with bins and bins of the kids toys. I love that when they’re done playing we can store them all out of the way. 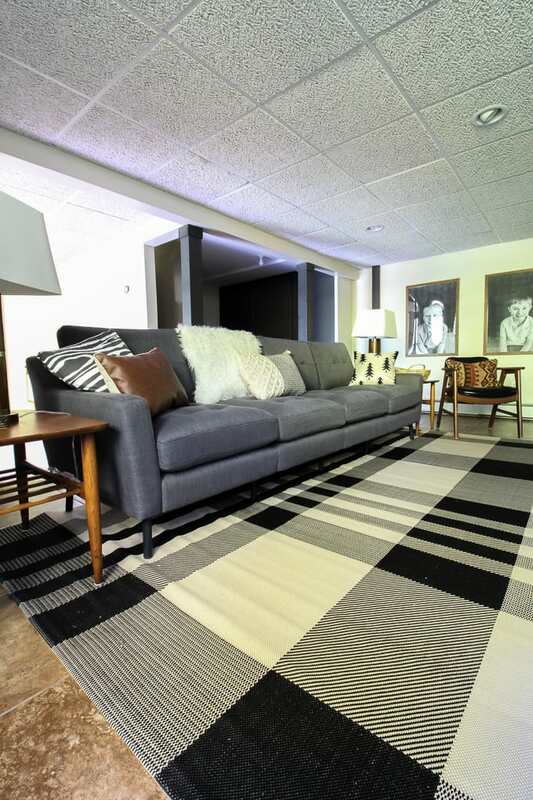 The other major game changer down here is our new sofa from Burrow. I went with the four seater, low arms in the color “charcoal”. You might have seen on my instagram or facebook that the sofa arrives via UPS in a few boxes! From there it takes about 15 minutes to assemble! The best part is that it’s super easy to dis-assemble if you ever want to move it! It’s also stain resistant and super durable. It’s so cool and comfortable down here now that this is where we’ve been spending our recent streak of hot days! The couch can be ordered in a 1-2-3- or 4 seater option in a variety of colors. I love that if we ever want to use it differently we can always just take out a section. 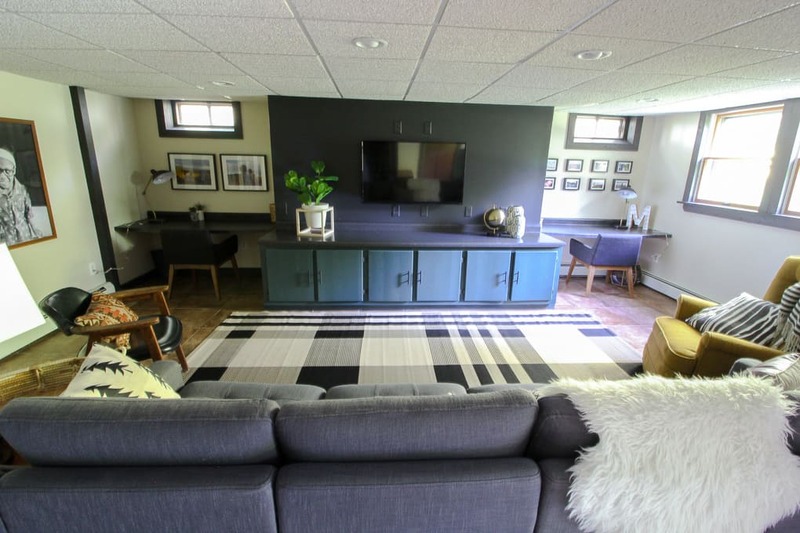 I’m also loving the way the modern black legs work with the rest of our furniture. 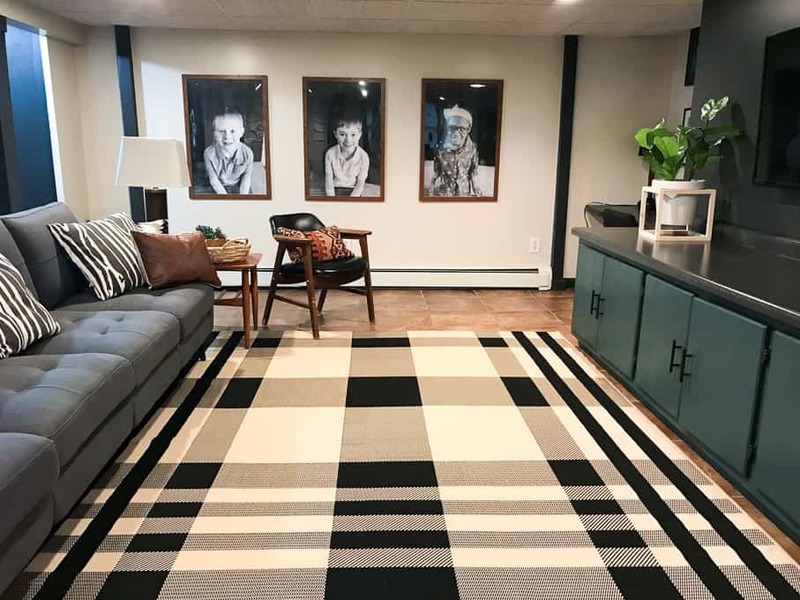 You’ve probably also noticed this amazing buffalo check rug?! I found this HUGE rug on Amazon for under $200! I couldn’t catch a picture of the engineer prints without a glare, but I promise, in real life they look awesome. 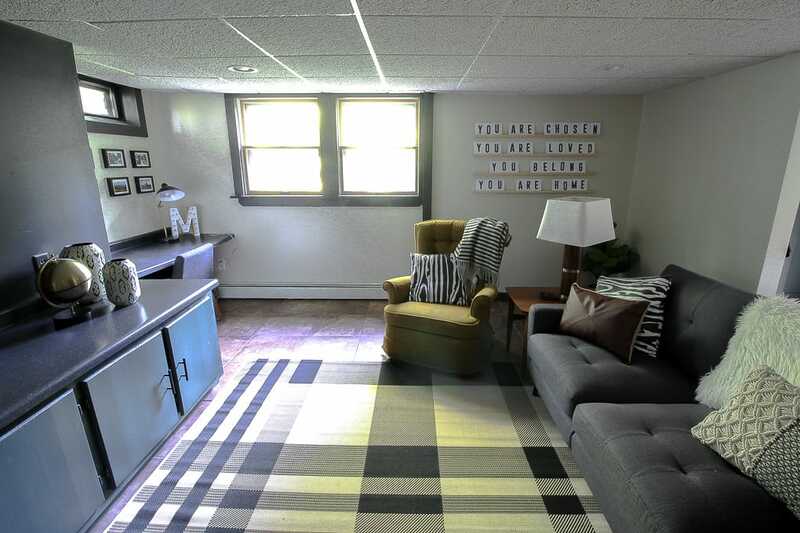 What better way to show the kids it’s their space than hanging huge pictures of them right?! Over on the other side of the room I built this letterboard ledge. Here is the tutorial for how to build a letterboard ledge for just $4! The letterboard ledges are easily changeable, so for now I spelled the phrase, “You are chosen, you are loved, you belong, you are home”. I just want my kids to always remember those things. 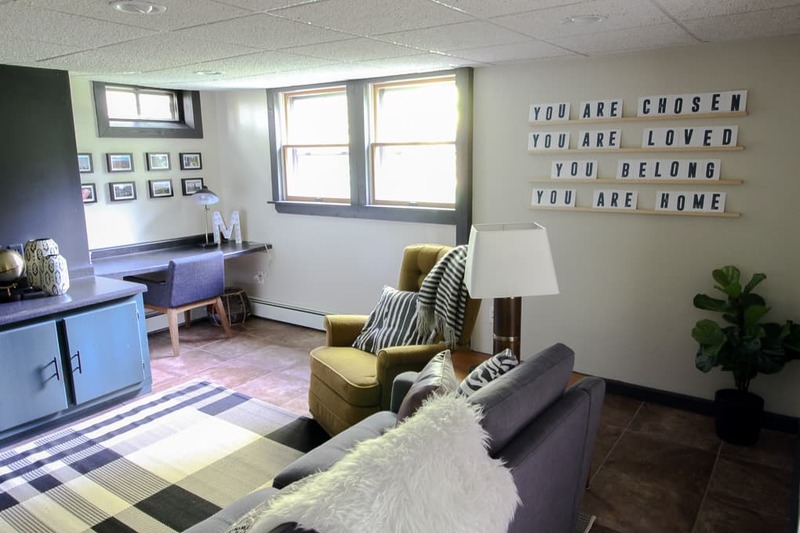 I’m so happy with how this room came together. 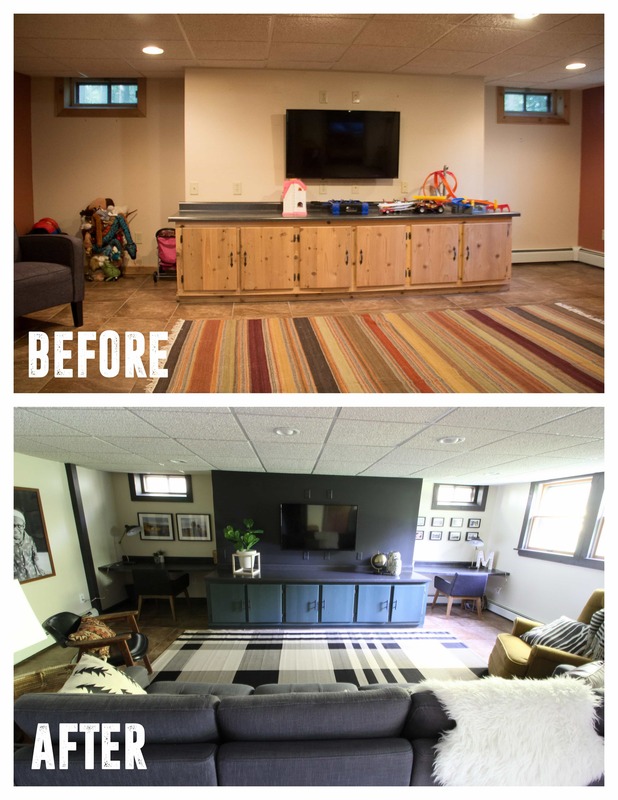 This room went from being very dated and orange, to being a modern retreat that our whole family can enjoy! 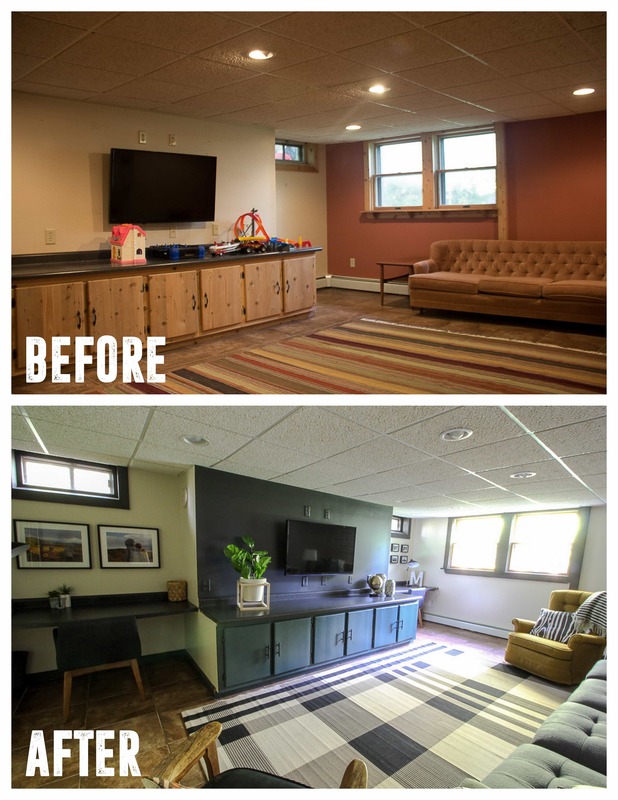 I hope that this inspired you that with a few cans of paint (and a bunch of time painting), you can completely transform any space! Burrow provided me with this sofa in exchange for an honest blog post sharing my opinions. I would not be sharing about it if I truly didn’t love it! I’m proud to stand behind the products I love, and only share items I would purchase as well. I just installed a Burrow sofa in an office. What a great piece! I definitely agree that it is very well made, comfortable and stylish – all for a great price. It was really easy to put together as well. Truly a great find. Awesome! I’m so glad you were as happy with it as we are! It really was a breeze to put together. Thanks for letting me know! L kitchen and bar. Big problem! NO Windows! ! Ceiling is those drop in white rectangles. Recessed lights with dimmerswitch.. Any suggestions about creating faux Windows?? Or making my room look brighter?? 450 sq. Ft. Thanks.. I need help! Marie. Oh, one end of room is tam brick wth nice gas logs in fireplace. Bummer. Our current unfinished basement has no natural light either. I would add mirrors to give the illusion of windows. Also keep the finishes light and neutral.